Microsoft has finally launched the mobile Edge browser on iOS and Android, adding to its cross-platform spread for almost all its offerings, along with a Microsoft Launcher for Android. The arrival of Edge browser across the major mobile platforms is strategically meant to serve as a bridge between the PC and your phone, which eases files exchange between these devices. 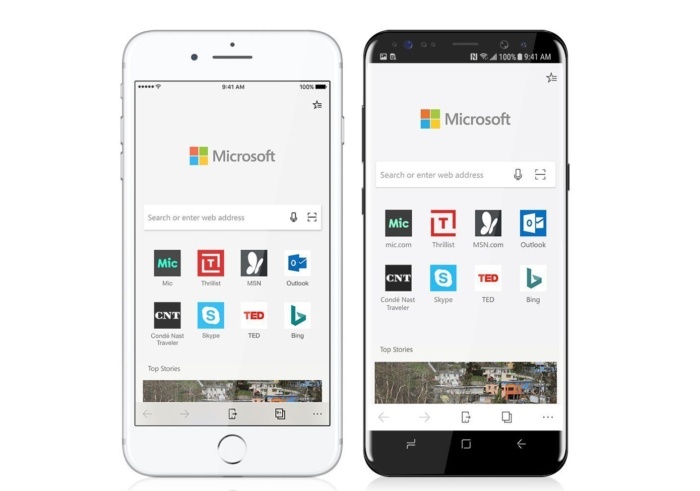 As the mobile Edge browser syncs with Microsoft account, it makes your history, Reading List, and favorite pages available across other devices. While it also includes a “Continue on PC” button that restores access to your work from mobile over to your computer, there's no confirmation if the mobile Edge browser syncs recent tabs like Chrome. Albeit, Microsoft didn’t specify whether your collection of e-books from the Microsoft Store will sync as well, but its expected given that the drive will turn Edge into an e-reader. The Microsoft Launcher for Android, on the other hand provides customizable home screen option in the usual Android launcher tradition. It allow users to add icons of their friends on the Android home screen for easy connectivity, akin to the My People app coming with the Windows 10 Fall Creators Update. The Launcher also reinforces the company’s cross-platform initiatives as it makes available information from Microsoft Calendar to the mobile devices.